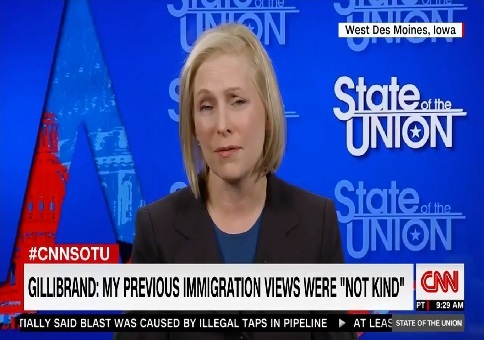 Sen. Kirsten Gillibrand (D., NY) apologized for her past views on immigration during a Sunday interview on CNN's State of the Union. Gillibrand's comments came in response to CNN host Jake Tapper's questions about her criticisms of President Donald Trump's stances on immigration. "If Trump's immigration positions are racist, were they racist when you held some of those positions as well?" Tapper asked. "They certainly were not empathetic and they were not kind and I did not think about suffering in other people's lives," Gillibrand said. Gillibrand went on to state that since taking office in the Senate, she has visit more of her New York constituency and changed her views after coming into contact with her voter base. "I realized things I said were wrong. I was not caring about others.," she said. "I was not fighting for other people's kids the same way I was fighting for my own."